Our employees are our secret weapon at Anderson Fire Protection, Inc. As a business built on establishing long-lasting relationships with our clients, we understand that our employees are the ones that truly perform and deliver results for our clients. We strive to create a culture of learning for our employees at Anderson Fire Protection, Inc. Our employees receive regular education on current safety regulations and the various systems we install. Our management team has over 100 years of combined experience and are NICET I, NICET II, and NICET IV-certified, so you know you’re working with the best. We work on a wide range of different project types, as opposed to specializing in a single type of building or application type. For our employees, this means you gain versatile experience that can be put to use throughout your career in fire protection services. Work for Anderson Fire Protection, Inc.
Anderson Fire Protection, Inc. offers a 4-year apprenticeship program in conjunction with Associated Builders and Contractors, Inc. (ABC) of Metro Washington http://www.abcmetrowashington.org who is our sponsor for this program. The responsibilities and work of the Sprinkler Fitter consists of the knowledge and ability to install all types of fire protection systems, including the layout and installation of underground fire mains. 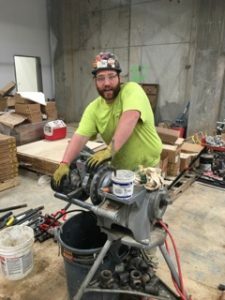 A Sprinkler Fitter is able to read blue prints and layout and install hangers and overhead piping in all types of buildings and all types of construction. Fire sprinklers are found in high-rises, warehouses, hotels, motels, multi-family, and single family homes. Applicants must possess a current, valid driver’s license (at time of dispatch). Applicants must take and pass an aptitude examination and an oral interview. When hired, apprentices must have transportation to get to any job in the Baltimore/Washington corridor. The Apprenticeship program is a four (4) year program. Apprentices must work a total of 8000 hours in four (4) years to reach journeymen level status. Apprentices are required to attend related instruction classes a minimum of 144 hours per year. A project coordinator position requires managing project labor, material purchasing, scheduling, submittals, change orders, and fire sprinkler system layout. This position also requires working with client project managers, attending client meetings and visiting project sites as necessary. Attend Sales to PM Turnover Meetings as required. Prepare and update project schedules. Work with salesmen, designers and administrative staff. Prepare material and drawings submittals for Architect and/or AHJ review. Prepare monthly Project Forecast to Complete estimates. Attend project specific & company meetings. Lists all material for fabrication and purchase. Provide shop drawing to field for installation. Perform PM to Field turnover meetings. Require Self-starter with the ability to work independently, yet comfortable to work within a team environment. Strong analytical and mathematical aptitude. Thorough knowledge of NFPA standards. Familiarity with general construction practices and terms. Ability to read and understand construction blueprints. Experience with Microsoft Office and Excel. Sales/Estimating individual will cultivate new business relationships, maintain existing accounts, and ensure the fulfillment of established sales goals through estimating and bidding fire protection projects. Embrace a consultative selling technique that includes the ability to analyze client needs, communicate appropriate solutions, and facilitate sales to closure. Willing to coordinate with other departments in the company, with owners and General Contractors.